v wedge wire wrapped well screen is made by wrapping and welding stainless steel V-shaped profile wire cylindrically around support rods under automatic wire screen machine. Each profile wire and support rod is welded by resistance welding. It is used in water well, oil well, gas wells and for environmental well completions. 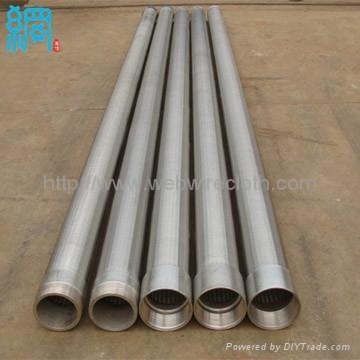 generally of stainless steel 304, 304L,316, 316L, 321 etc. We also produce special material according to the customer request. They are wrapped with moisture-proof paper or other packing materials inside.The outer package should be wooden pallets or wooden cases.We can also pack according to customer requirements. Application used for oil, gas, water well. 2. Samples production and delivery service can be provided. Customized packing for your request . 4. All products have been strictly quality test in our factory.